A new English translation by Adam Braus of the Karaṇīya Mettā Sutta — On Kindness. The Metta Sutta is widely read and revered by Mahayanan Buddhists — like Tibetan and Zen Buddhists — but it actually is one of the oldest written scriptures of the time after Siddhartha. It has become a very common prayer, perhaps because of its simplicity. Its overwhelming teaching is that cultivation of kindness is a sure way to relieve anguish and anxiety and wake up to the truth of the world. Other translations maintain a somewhat stilted sound, which comes from a very literal translation of the Pali phrasing. But in this translation, I’ve made every attempt to use plain and straightforward English language while staying true to first the literal meaning, and second to the inner meaning of the teaching: that compassion and kindness for all is a sure way to end suffering and awaken to the truth of the world and ourselves. 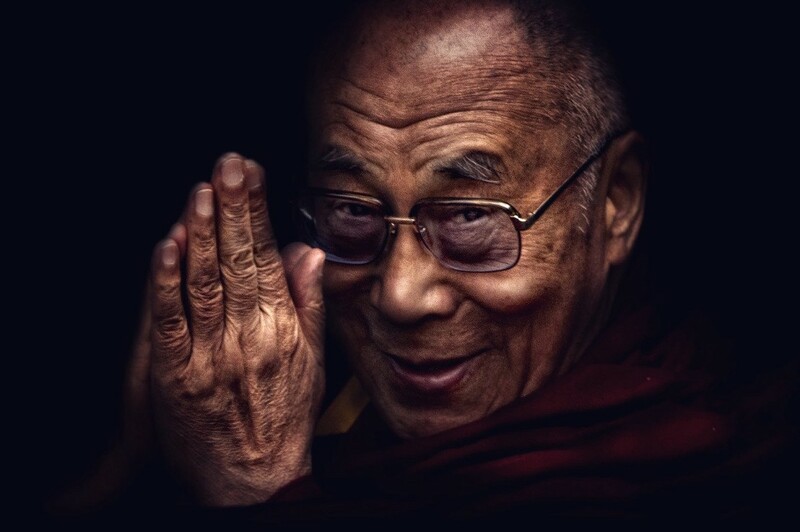 I have been inspired by the example of compassion of His Holiness the 14th Dalai Lama to write this new translation from the original Pali, and I dedicate it to him. and who never does anything to earn criticism from the wise. may all beings have joy! or wish anyone to suffer. unobstructed and free, without meanness or hostility. having overcome attachment to craving, they escape the womb of suffering. I’m not happy with this more literal patterning since it loses the simplicity and power of the more straightforward English phrasing. A good person — The first three stanzas are a description of santa or a good or virtuous person — here translated very simply for accessibility as “a good person”. May they say: — What no other translation accomplishes is to break up the sutta based on its natural chunks, so I made the second section quoted, as if to say “this is what a good person actually says”. I take this small liberty with the phrase Karaṇīyam-attha-kusalena to include doing and saying, as karaniyam means deed but also business or duty or act of devotion. So I felt like I could squeeze “saying” into that in order to achieve the bigger goal of breaking up the sutta into natural parts. Also the vocative phrases “May all beings be happy” are quite sudden and jolting otherwise, but if made quotes, make more sense as ululations of the santa. Who is… and — The whole first stanza is a list of things that this Santa has — padam abhisamecca, sakko, uju, suhuju, suvaco cassa mudu, anatimānī. All the parts of the sutta are stitched together with ca which is a copulative particle. Here the cadence of repetition is achieved with the repetition of pairs of “who is … and …,”. Joy, love, and happiness — safe and secure — The first three stanzas ends with an invocation for sukha the opposite of dukha which is the “suffering” cited in the four noble truths. It begins with sukhino “those who possess/embody joy” and ends with sukhita “joy of the self/mind” This is suggesting that what is about to be described is a solution to suffering, and a way to joy, on par with the eight-fold path. In order to bring across the importance and completeness of this joy in body and mind, I use “Joy, love, and happiness — safe and secure” — as a translation of sukino across from sukhita. Develop their hearts and minds beyond all limitation —“Mānasam bhāvaye aparimānam” is probably the hardest part of the sutta to translate.It is virtually untranslatable. Mānasam, and aparimānam are both founded on the word mana which means “consciousness, intention, or mind” but also “measure or measurement”. The only line said twice “Mānasam bhāvaye aparimānam” could be translated: “Mind cultivating infinite”, or “Measure becoming measureless”, instead of a more literal: “cultivating a boundless mind,” or “by which producing a measureless measure (mind). Here I ended up with “develop their hearts and minds beyond all limitations”. I use hearts and minds because the rest of the sutta is suggestive of feeling, emotion, love, and moral action. To use only the English word “mind” would come across as intellectual, moreover the strict difference between the heart and the mind is a western construction, and many cultures see those as having similar origins. Also this phrase “heart and mind” is a key to the inner meaning of the sutta — namely that development of one’s kindness leads to an enlightenment that is of the whole being, including the intellect. Awakening to life or about to awake — Bhūtā vā sambhavesi — this is a phrase that every translation missed an opportunity. Bhūtā is the past participle of bhavati which means “develop” or “becoming” but in spiritual texts it has the connotation of spiritual development — so here I use the English phrase “awakening to life” to connote both “waking up for the first time after being born”, and at the same time connoting spiritual awakening. Although this is fraught b/c “awaken” is the root of the word Buddha… but then again, the word sambhavesī is used in the sutta a few lines down to mean exactly that — spiritual cultivation. Moreover, the thrust of this sutta is that compassion, wishing all beings well and supporting their joy, is the path to awakening and ending suffering. And one danger of pursuing spiritual awakening is to scorn those who do not seek a similar awakening. So it is important that the connotation of compassion for everyone, even for those who have not “come to be” spiritually yet. Whatever their station — katthaci naṃ kiñci — katthaci literally means “anywhere” and kiñci means “something”, but there is an opportunity here to continue the spacial language while extending it to social space using the word “station” which means both physical and social place. Should & Must & May — Throughout the use of the optative case is used to denote a polite sense of the imperative. I used “should” “must” and “may” constructions to denote varying polite senses of the imperative. Compassion is the abode of God— Brahmam-etaṃ vihāraṃ idham-āhu — Surprisingly I’ve never read a translation that translates this line literally, but nevertheless there it is. Near the end of this sutta the Hindu influences of Theravada Buddhism are very apparent. Although this sutta is chanted and read by Mahayanan Buddhists, it is actually an ancient Pali sutta written none-to-long after Siddhartha died. Buddhism lived within the Hindu cosmos with deva (spirits) and Brahma (God). Most western Buddhists I’ve met are fallen away Christians and might balk at the word “God” in a Buddhist text, but this is a bastardization of Buddhism that is in every branch rich with faith, God, gods, and spirits. Having overcome attachment to craving, they escape the womb of suffering — the literal translation here is “having removed greed for sensual pleasures, he assuredly does not come to a womb again.” I wanted to give a translation that got at the inner meaning of the metaphors used in this phrasing. “Coming to a womb” refers to how in Theravada Buddhism the goal of meditation and the consequence of enlightenment (“arhatship”) was to end reincarnation. But what is the inner meaning of reincarnation? I suggest there are two: first, the endless cycles of aversion and attraction, which through the teachings of Buddha can find an end; and second, reincarnation acts as a metaphor for universal compassion — since if we’ve been born as all beings, and the mother of all beings, then we have been every beings mother before and they our children, so we can have compassion for those beings. In this case, I use the first inner meaning here since it is inline with the meaning of the sutta: compassion and kindness is a sure way to gain total enlightenment.